The marketing landscape today is more expansive than ever and it continues to get broader, as new marketing tools, marketing channels, and technologies emerge. In addition, there is more information available about the workings of the human mind, human behavior studies and advanced technologies. With all this also comes a great bit of confusion for not only the marketers, but for everyone within the organization. Almost everyone has a different view of what marketing is about and what it should be doing, from executives to even between marketers. Therefore, in general, marketing has become so ambiguous that it has unfortunately become less effective in its function. It does not help of course, that many marketers unfortunately don't fully understand the business of marketing. They don't know the marketing mix, the ever-expanding marketing disciplines and instruments, key differences between brand and call-to-action activities, the difference between strategy and tactic, business metrics, strategic leadership, etc. There are many reasons for this: education, training, interests, experience, rapid diversification of channels, leadership skills, etc. And of course many business leaders don't really know or understand what marketing really is and what it can do. Unfortunately, it is not clear to most people that marketing has become both a science and an art and is now more multifaceted than ever before. Therefore many executives from other functions within the organization are taking a more active role in their companies marketing. Thus not always being of an advantage as they very often don't see and understand the whole picture of marketing's capabilities. With the every increasing number of marketing channels there are more marketing specialists than ever before. These specialists perform vertical disciplines such as direct marketing, email marketing, social media marketing, search engine marketing and optimization (SEM/SEO), public relations (PR), advertising, events, radio, TV, and telemarketing. These vertical marketing specialists often lack the skills of seeing the big picture, of integration and the capacity to work across a wide range of marketing disciplines and business functions, which limits the company's potential and opportunities. These specialists bring a depth that can not be overlooked, as there is proven value in what they bring to a program or discipline. However, broad and general (horizontal) marketers are the "secret" key in today's knowledge economy, global age and fragmented markets. With an endless flow of new and complex information, coming from various sources and constantly changing, it is "horizontalists" who are able to best make sense of it all and pick the best possible courses. Generalism is not simply a nice-to-have any more; it is essential that someone focuses on everything. They are the ones that value diversity, know the world beyond their plate and observe and understand how things interact. These horizontal marketers are leaders that work with the vertical specialists to best utilize today's marketing capabilities to strategically achieve innovative and sustainable results for their organizations. 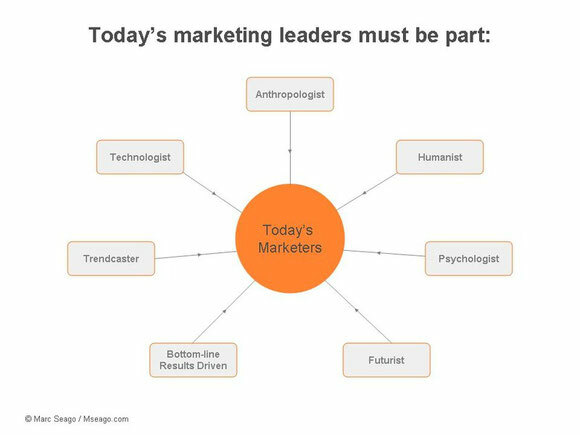 Therefore today's marketing leaders must have a diverse blend of skills and experiences; being part humanist, part psychologist, part anthropologist, part technologist, part futurist and part trendcaster, while at the same time being bottom-line results driven. They have to be like decathletes, well-rounded athletes. Some are more creative, some more analytical and some are more process driven. Either way, marketing has become a very complex subject and discipline where more horizontal marketers are required. See how M's services can assist you with your marketing needs. Or, contact M for any specific marketing needs you may have.